We know that BMW and Toyota are working together to create a new sports car. What we don't know is what form that collaboration will take. 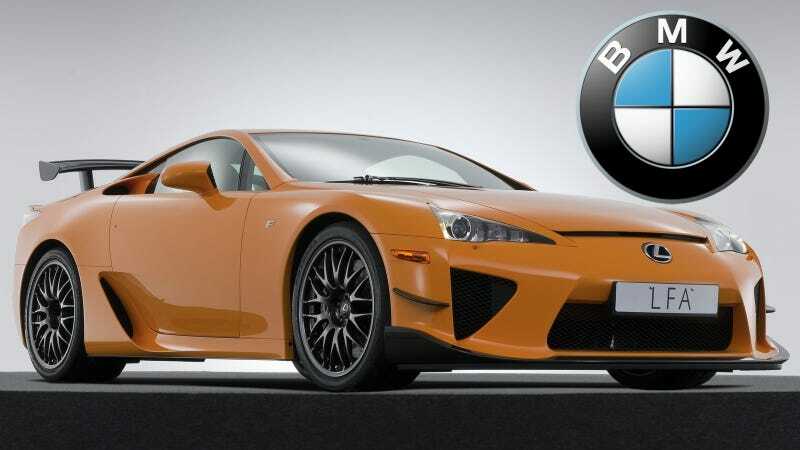 The latest rumor is that it will be a high-end hybrid supercar that will pick up where the Lexus LFA left off. That's different from the last rumor we heard, which is that the car would be a sort of neo Supra/BMW Z5 with a hybrid drivetrain and a reasonable amount of power. What's really going on here? The latest news comes from Australia's Motoring, which says the new car will be a flagship performance car in the $300,000 range and not just a souped up Scion FR-S. The reason for this, they say, is the high development costs involved with a high-performance hybrid built from lightweight materials. I was kind of hoping for a somewhat more moderately priced Supra revival fit to take on the Nissan GT-R, but this is cool too. We weren't surprised when, during a recent trip to Toyota's proving ground near Mt Fuji, we saw a BMW i8 plug-in hybrid super-coupe sitting in the carpark. Our source tells us that in addition to emissions trials, Toyota is conducting durability testing of the i8's carbon-fibre frame in relation to the pair's jointly developed sports car. HMMMM! The i8 has been hanging out in Japan, I see. Isn't that a beard-scratcher! Motoring speculates that this car could use the BMW 4.4-liter V8 coupled with Toyota's hybrid tech and the carbon fiber goodness from the LFA, which is a tantalizing performance recipe for sure. Think McLaren P1, Porsche 918 or LaFerrari, only cheaper, and you're there. But it's important to note that no concrete details about the Toyota-BMW sports car have emerged yet, and everything we have continues to be just rumor and conjecture. It's probably going to be that way for a while, too. Anyone else getting the popcorn ready?